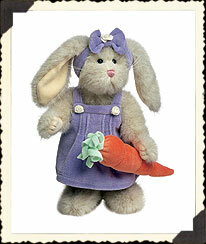 Brittney, a cream hare complete with velvet carrot, looks smashing in her lilac velvet headband and pinafore with white rosette accents. Our plush, fully wired Felicia rabbit features satin inner ears and wears an outfit fashioned from satin with button and brocade accents. 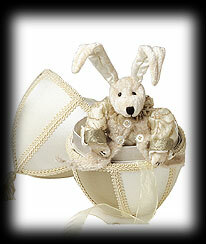 She comes packaged in her own satin, tassel-topped Treasure Egg that opens with a simple organza ribbon! 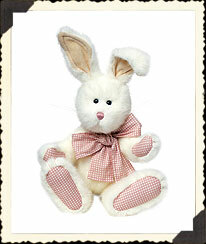 Our plush, fully wired Peter rabbit features satin inner ears and wears an outfit fashioned from satin with button and brocade accents. 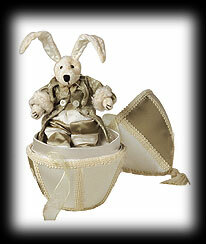 He comes packaged in his own satin, tassel-topped Treasure Egg that opens with a simple organza ribbon! Peaches is named for her favorite fruit and 'cause she's just so sweet! Our bean-filled snow-white bunny features peach checked paw pads and ear lining to match her bow tie and posable bunny ears! 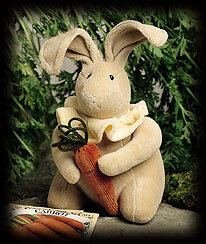 Fill Easter baskets with our velveteen rabbits, which feature wired ears, bean filling at the base, and their own special accents-a felt heart, a velvet carrot with yarn greenery!